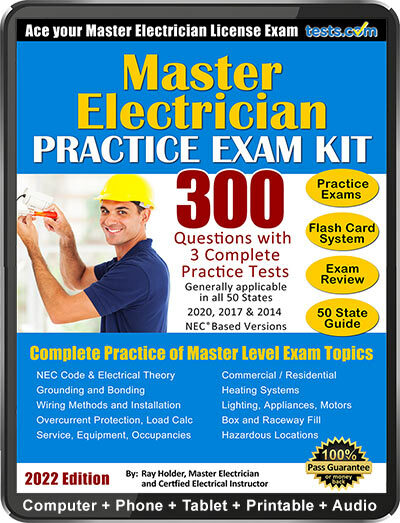 Electrician Practice Test (2019 current) Explained Answers. Instant Scoring. Take a free Electrician Practice Test to see what kind of questions are on actual electrician license exams. Most states require an electrician to pass an exam to receive a journeyman or master electrician license. State exams cover such areas as Electrical Theory, Trade Knowledge, Grounding and Bonding, Wiring Methods and Installation, Overcurrent Protection, Load Calculations, etc. With Tests.com, you have the option to purchase a practice test kit based on the 2011, 2014 or 2017 NEC Codes. Check with your local code official to determine which code applies to your location. 3. What is the most frequently used wire size for interior wiring? 4. If you have four to six 12 AWG wires in a conduit, what would be the allowable current-carrying capacity in percentage to the normal? 5. If a box is to contain four No. 10 conductors and two No. 12 conductors, what is the minimum sized box that can be used in cubic inches? 6. A run of electrical conduit may not have more than _____________ quarter bends between fittings and outlets? 7. The total load on any single overcurrent device in a panelboard must not exceed 80 percent of its capacity where the load continues for 3 or more hours to avoid overheating of the conductor. 8. A fuse should be rated higher than the lowest rated component in a panelboard to be protected. 9. Which of the following locations would most likely require installation of a ground fault circuit interrupter? 10. An open circuit occurs in a wiring system when _____________________. 11. Short circuits or grounds can be all of the following except __________________. 12. Which phase is probably open when you test Phase A and Phase B and get a low voltage reading, test Phase B and C and get a normal reading and test Phase A and C and get a low voltage reading? 13. In residential buildings, small appliance loads should have two or more ________________. 14. What law would you use to determine the voltage of a power supply? 15. Ohm's law states ____________________. 16. The amount that a given conductor resists the flow of electric current is measured in___________. 17. Which law holds that like-charged objects repel and opposite- charged objects attract? 18. Direct current can change direction. 19. Alternating current changes direction at which of the following frequencies? 20. Electron Theory and Conventional Theory hold opposite current flow directions. 21. Which of the following will not affect the resistance of a circuit? 22. The greater the resistance, the more power is dissipated in the form of heat energy. 23. Which of the following are a source of electricity? 24. In a series circuit, the current has ___________ path(s) to take. 25. When connecting a voltmeter lnto a DC circuit, what should be observed? An electrician must be licensed. Licensure typically requires the passing of an exam. 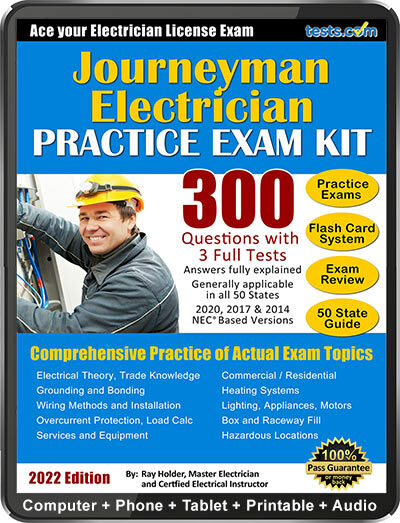 Learn more about the exams with our Journeyman and Master Electricians' Test Guide.